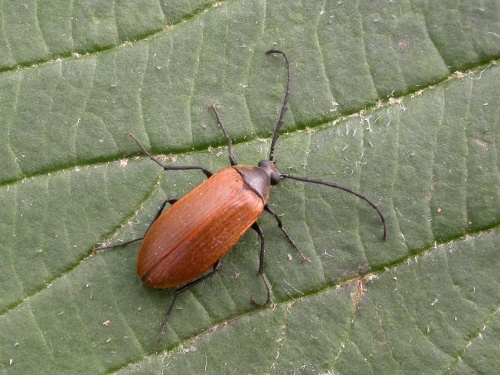 Length 9 to13mm this distinctively shaped beetle has yellow-brown elytra, but is otherwise mainly black. Usually in well wooded areas where adults may be found on blossoms or decaying wood. Larvae develop in decaying wood. This is a southern English species, with an occasional record further north to Nottinghamshire. Rare in Leicestershire and Rutland. The Stockerston specimen of 22nd June 2014 is believed to be only the 2nd record for VC55.